With such a large array of investment choices, from stocks and bonds to closed‑end funds and exchange‑traded funds, it can be difficult to decide where to put your money. To further complicate matters, there’s always something new being hyped in the marketplace. Current buzz is focused on cryptocurrencies and emerging technologies like artificial intelligence and self‑driving vehicles. You might be eager to invest early and capitalize on potential growth, but are these sound opportunities? Moreover, it seems as if everyone has advice for you. Unfortunately, platitudes like “buy low and sell high” aren’t very helpful, and those stock tips from your friend’s brother, or your uncle’s golf buddy, rarely pan out. So how can you cut through all the noise and figure out what’s right for you? Consider these three words instead: back to basics. The best investment strategy is one that’s focused on the long term, on tried and true strategies that have stood the test of time. First and foremost, think about why you are investing. Whether it’s for your retirement, education savings for your kids or a dream vacation, figure out how much money you’ll need and how long you have to get there. 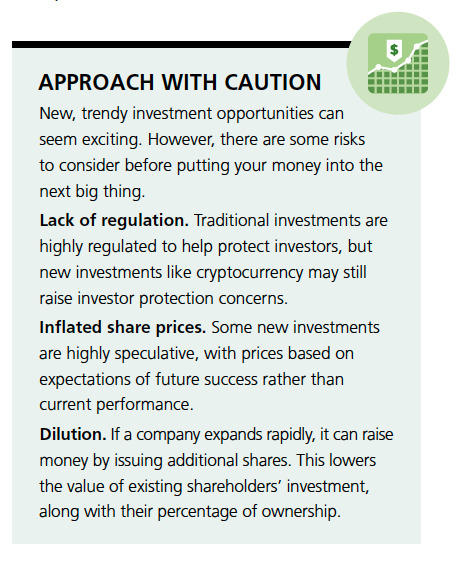 Higher risk can equal higher potential reward, but the amount of risk in your investment portfolio should correspond to the time horizon of the investment. For example, if you’re investing for retirement 30 years in the future, your portfolio can tolerate greater risk because it has more time to ride out any market downturns. It’s also important to consider your personal comfort with risk – how well you can handle a loss in the value of your investments if there is a market downturn. Make sure you are invested appropriately for both your risk tolerance and your time horizon. The sooner you start, the more time your investments have to grow, even if you can only afford a modest amount. Someone who starts in their 40s will have to invest a lot more than someone who began investing in their 20s in order to reach the same value.1 Give compounding returns as much time as possible to work their magic. A relatively painless way to save is through a pre‑authorized deposit. Set one up on your payday or through your company’s payroll, if available, so that money is deposited into your investments before you have a chance to spend it. You’ll be surprised at how fast your savings will accumulate without you even noticing. It’s also a good idea to set up a separate emergency fund in an easily accessible account, such as a high‑interest savings account. If the need arises, you’ll have access to money without having to dip into your investments. Don’t put all your eggs in one basket. It’s important to spread your investments across asset classes (stocks, bonds, etc. ), industries and geographical locations. If you put all your money in one stock and its value plummets, you significantly reduce your investment. The same would hold true if you were to invest in one industry. For example, if you invest only in energy and the price of oil declines, so may the value of your investment. Diversification helps to balance individual investment risks across an entire portfolio, lowering your overall risk. Regardless of new investment opportunities that promise high returns, it’s important to have a plan and stick with it. Markets may fluctuate, but a well‑thought‑out investment plan is designed to ride out those fluctuations. And if you still want to invest in the latest and greatest growth opportunity, consider setting up a “core and explore” portfolio. This means the bulk of your portfolio (the “core”) is designed to meet your goals and overall risk tolerance, while a small portion of your portfolio can be used to explore riskier, more speculative investments. The best course of action? Speak with your advisor. He or she can help you cut through the market noise to determine the best investment strategy to help you meet your goals.